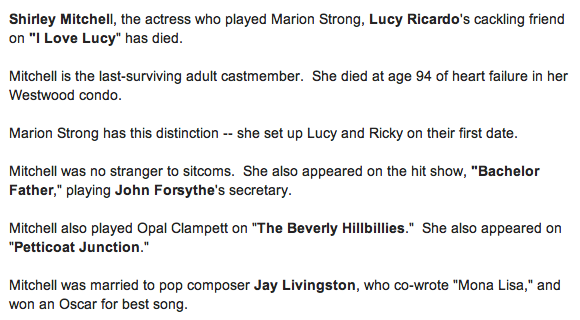 Actress Shirley Mitchell (aka Marion Strong) died today at age 94. The morons over at TMZ say she's the last surviving cast member of I Love Lucy, forgetting that the actor who played Little Ricky (Keith Thibodeaux, 62) is still alive and kicking. 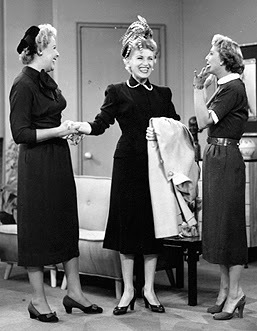 Marion Strong was in one of our favorite I Love Lucy episodes "Lucy Tells The Truth." Who can forget, "Well Marion, if that's the kind of hat you wanted you sure got a good one!"